This lithograph is taken from plate 14 of Emily Eden's 'Portraits of the Princes and People of India'. It shows one of the favourite horses of Maharaja Ranjit Singh with the head officer of his stables. 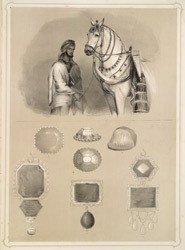 Passionately fond of horses, Singh had them adorned with costly jewelled trappings, mostly emeralds, which were said to be worth more than £300,000. He inspected his numerous horses daily and on special occasions they were adorned with the finest jewels of his treasury, including 'Kohinoor', at the time the largest diamond known to exist. Singh sent his large collection of precious stones to the Governor-General's camp for the ladies to inspect. Eden drew and numbered several of them. Number 1 is the Kohinoor, which was originally taken from the Peacock Throne at Delhi by Nadir Shah and later extorted by Singh from Shah Shuja of Afghanistan. Number 2 is a pearl: Ranjit considered pearls next in value to the Kohinoor, and had long strings of them. Number 3 is an uncut ruby with Persian characters engraved upon it. Number 4 is a Topaz, which stone, wrote Eden, Indians valued more than Europeans. Numbers 5, 6 and 7 are emeralds from the trappings of the horse.